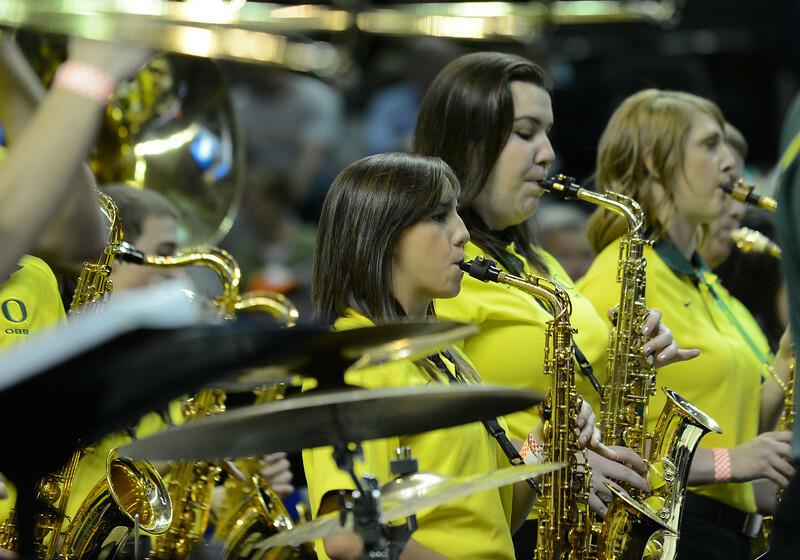 March 23, 2013: Members of the Oregon Ducks band perform during a game between the Oregon Ducks and the Saint Louis Billikens in the third round of the NCAA Division I Men's Basketball Championship at HP Pavilion in San Jose, California. 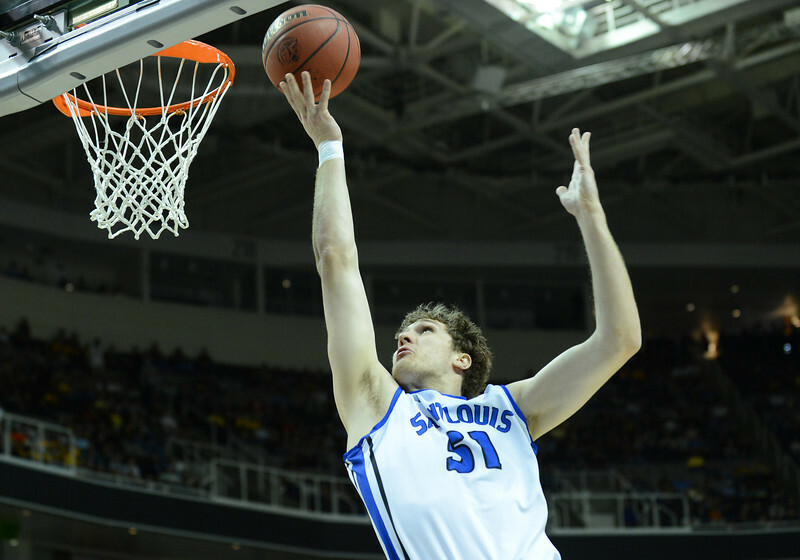 March 23, 2013: Saint Louis Billikens forward Rob Loe (51) drives in for a layup during a game between the Oregon Ducks and the Saint Louis Billikens in the third round of the NCAA Division I Men's Basketball Championship at HP Pavilion in San Jose, California. March 23, 2013: A Oregon Ducks cheerleader performs during a game between the Oregon Ducks and the Saint Louis Billikens in the third round of the NCAA Division I Men's Basketball Championship at HP Pavilion in San Jose, California. March 23, 2013: An Oregon Ducks cheerleader performs in a timeout during a game between the Oregon Ducks and the Saint Louis Billikens in the third round of the NCAA Division I Men's Basketball Championship at HP Pavilion in San Jose, California. March 23, 2013: Saint Louis Billikens cheerleaders raise their poms while a Saint Louis Billikens player shoots a free throw during a game between the Oregon Ducks and the Saint Louis Billikens in the third round of the NCAA Division I Men's Basketball Championship at HP Pavilion in San Jose, California. 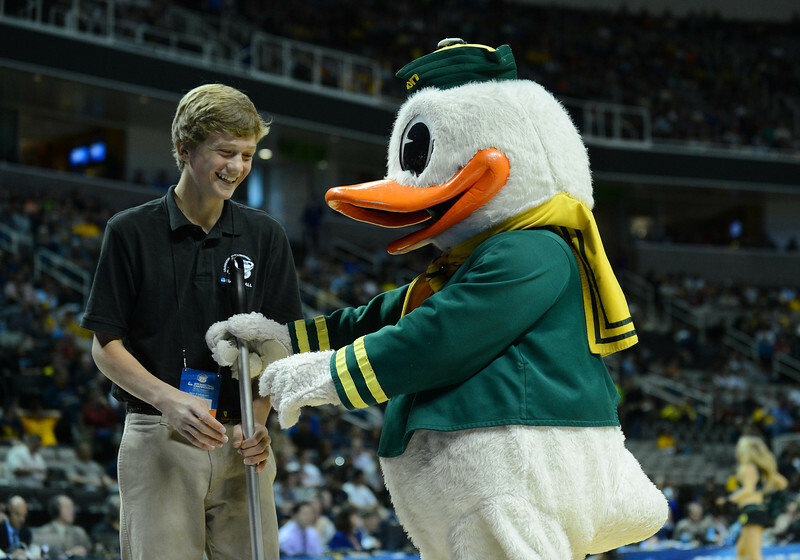 March 23, 2013: The Oregon Ducks mascot plays with one of the ball boys in a timeout during a game between the Oregon Ducks and the Saint Louis Billikens in the third round of the NCAA Division I Men's Basketball Championship at HP Pavilion in San Jose, California. March 23, 2013: Oregon Ducks cheerleaders perform in a timeout during a game between the Oregon Ducks and the Saint Louis Billikens in the third round of the NCAA Division I Men's Basketball Championship at HP Pavilion in San Jose, California. 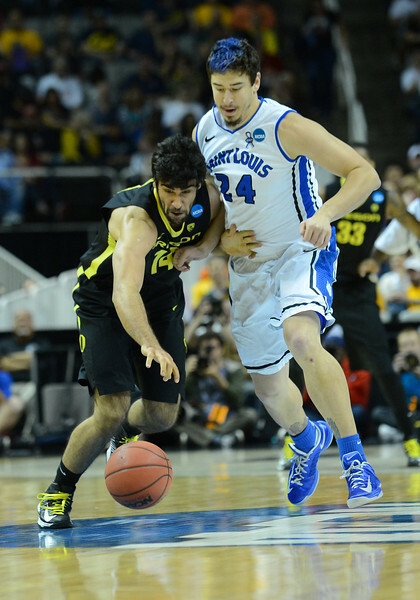 March 23, 2013: Oregon Ducks forward Arsalan Kazemi (14) and Saint Louis Billikens forward Cody Ellis (24) battle for a loose ball during a game between the Oregon Ducks and the Saint Louis Billikens in the third round of the NCAA Division I Men's Basketball Championship at HP Pavilion in San Jose, California. March 23, 2013: Oregon Ducks forward Carlos Emory (33) and Saint Louis Billikens forward Cory Remekun (32) battle for a rebound during a game between the Oregon Ducks and the Saint Louis Billikens in the third round of the NCAA Division I Men's Basketball Championship at HP Pavilion in San Jose, California. 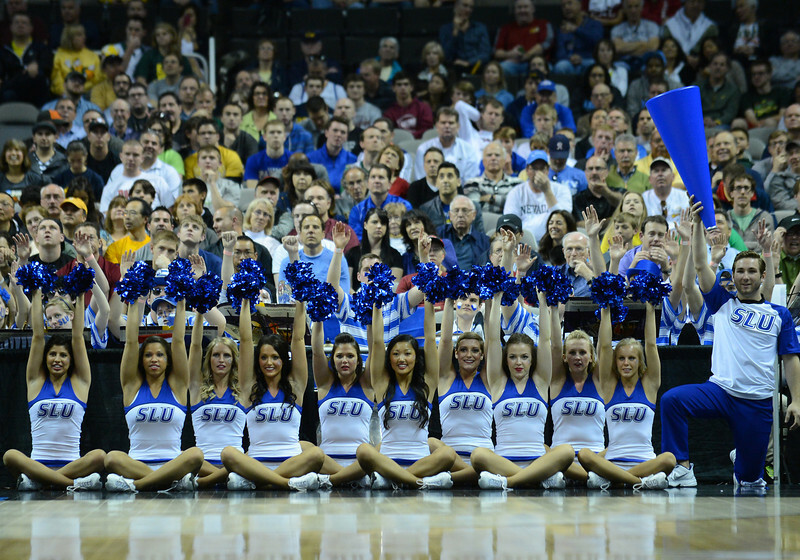 March 23, 2013: Saint Louis Billikens cheerleaders perform in a timeout during a game between the Oregon Ducks and the Saint Louis Billikens in the third round of the NCAA Division I Men's Basketball Championship at HP Pavilion in San Jose, California. 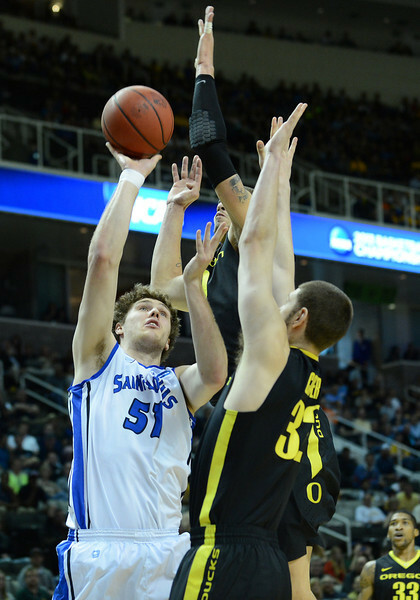 March 23, 2013: Saint Louis Billikens forward Rob Loe (51) puts up a shot during a game between the Oregon Ducks and the Saint Louis Billikens in the third round of the NCAA Division I Men's Basketball Championship at HP Pavilion in San Jose, California. 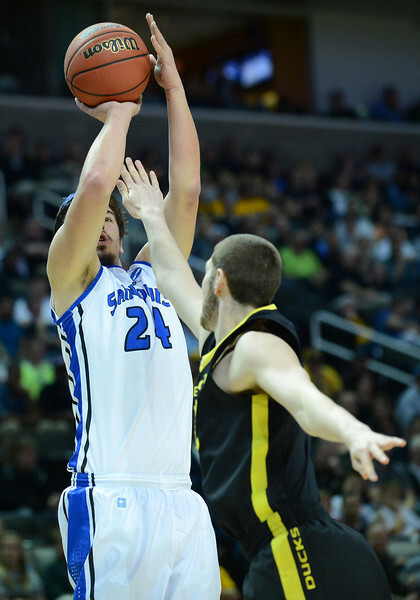 March 23, 2013: Saint Louis Billikens forward Cody Ellis (24) puts up a shot during a game between the Oregon Ducks and the Saint Louis Billikens in the third round of the NCAA Division I Men's Basketball Championship at HP Pavilion in San Jose, California. 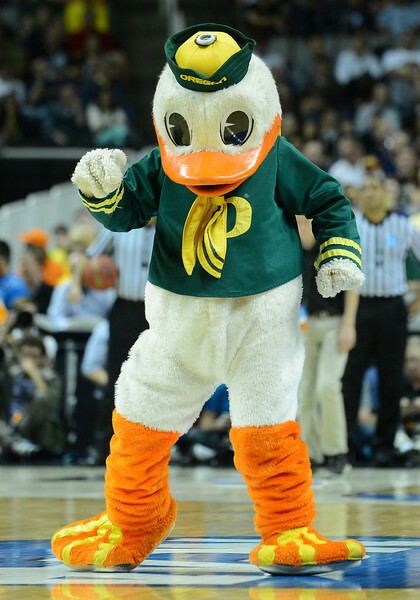 March 23, 2013: The Oregon Ducks mascot performs in a timeout during a game between the Oregon Ducks and the Saint Louis Billikens in the third round of the NCAA Division I Men's Basketball Championship at HP Pavilion in San Jose, California. March 23, 2013: A Saint Louis Billikens cheerleader performs in a timeout during a game between the Oregon Ducks and the Saint Louis Billikens in the third round of the NCAA Division I Men's Basketball Championship at HP Pavilion in San Jose, California. 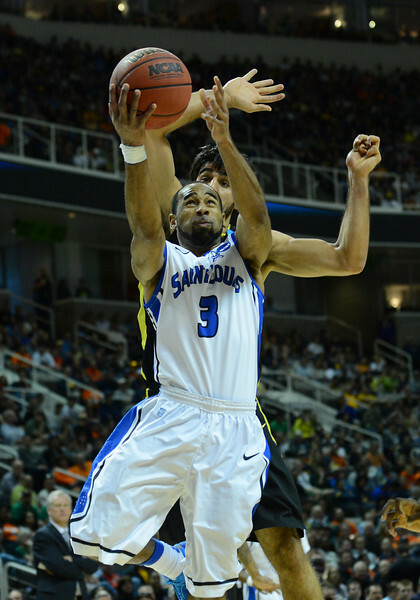 March 23, 2013: Saint Louis Billikens forward Grandy Glaze (1) puts up a shot during a game between the Oregon Ducks and the Saint Louis Billikens in the third round of the NCAA Division I Men's Basketball Championship at HP Pavilion in San Jose, California. 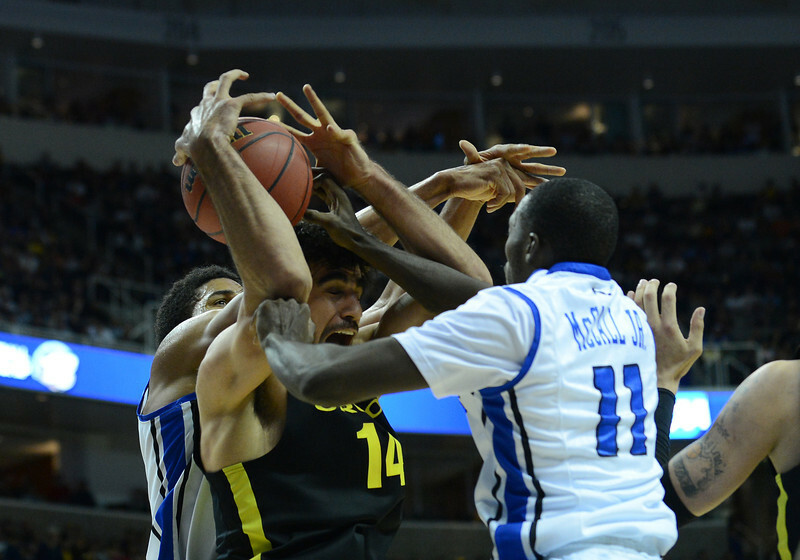 March 23, 2013: Saint Louis Billikens forward Grandy Glaze (1) and Oregon Ducks forward Arsalan Kazemi (14) battle for a rebound during a game between the Oregon Ducks and the Saint Louis Billikens in the third round of the NCAA Division I Men's Basketball Championship at HP Pavilion in San Jose, California. March 23, 2013: Oregon Ducks forward Carlos Emory (33) shoots over the defense of Saint Louis Billikens forward Dwayne Evans (21) during a game between the Oregon Ducks and the Saint Louis Billikens in the third round of the NCAA Division I Men's Basketball Championship at HP Pavilion in San Jose, California. 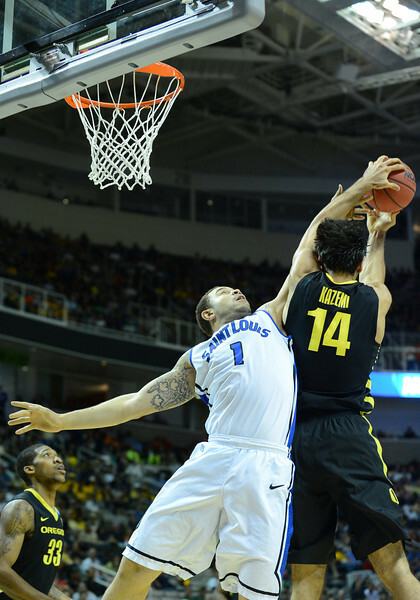 March 23, 2013: Saint Louis Billikens forward Cory Remekun (32) is fouled by Oregon Ducks forward Ben Carter (32) during a game between the Oregon Ducks and the Saint Louis Billikens in the third round of the NCAA Division I Men's Basketball Championship at HP Pavilion in San Jose, California. 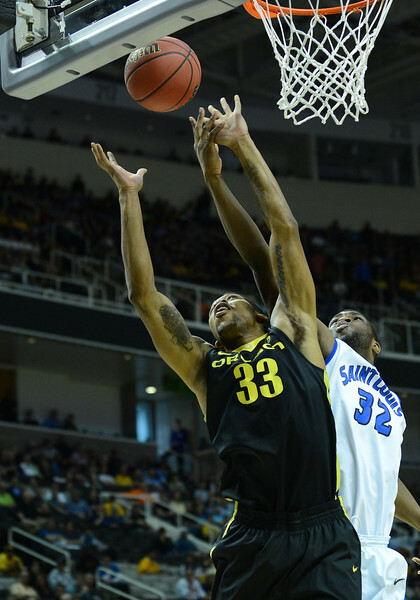 March 23, 2013: Oregon Ducks forward Carlos Emory (33) puts up a shot over Saint Louis Billikens forward Cory Remekun (32) during a game between the Oregon Ducks and the Saint Louis Billikens in the third round of the NCAA Division I Men's Basketball Championship at HP Pavilion in San Jose, California. 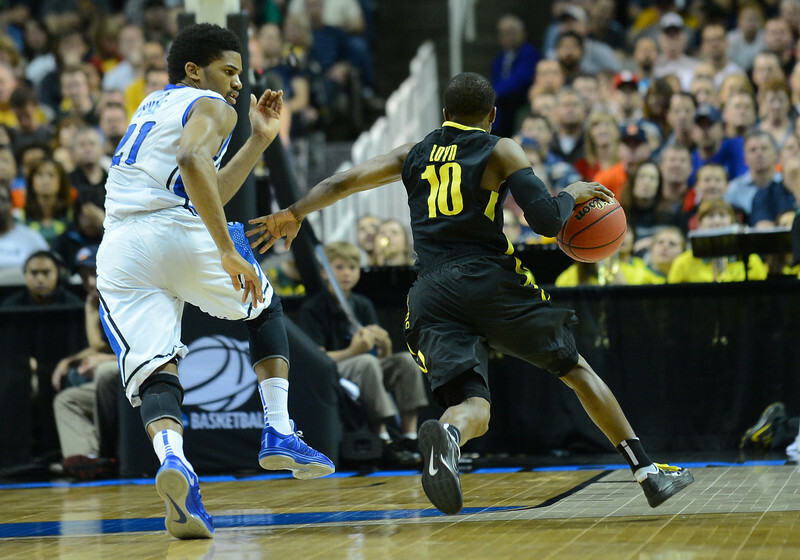 March 23, 2013: Oregon Ducks forward E.J. 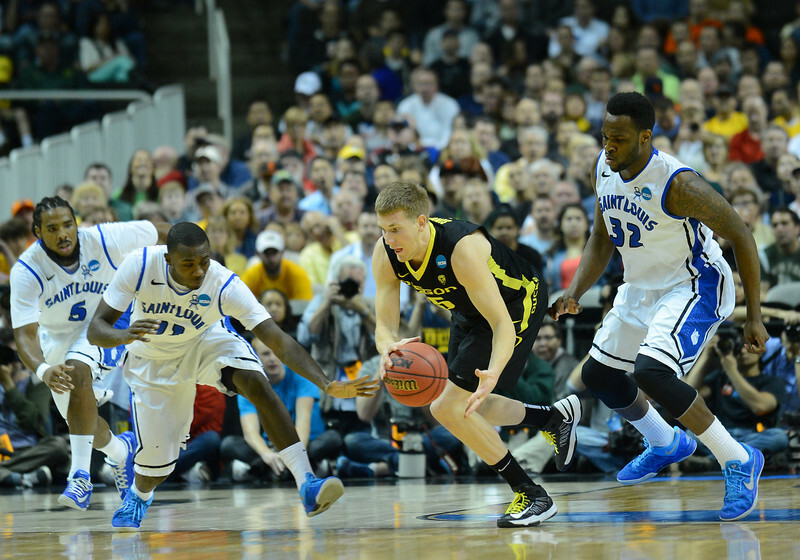 Singler (25) grabs a loose ball during a game between the Oregon Ducks and the Saint Louis Billikens in the third round of the NCAA Division I Men's Basketball Championship at HP Pavilion in San Jose, California. 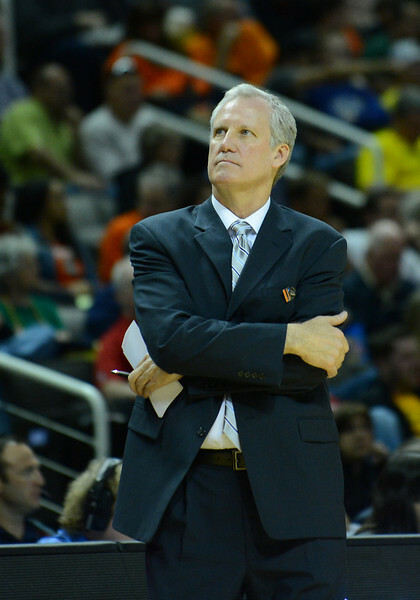 March 23, 2013: Saint Louis Billikens head coach Jim Crews looks into the crowd during a game between the Oregon Ducks and the Saint Louis Billikens in the third round of the NCAA Division I Men's Basketball Championship at HP Pavilion in San Jose, California. 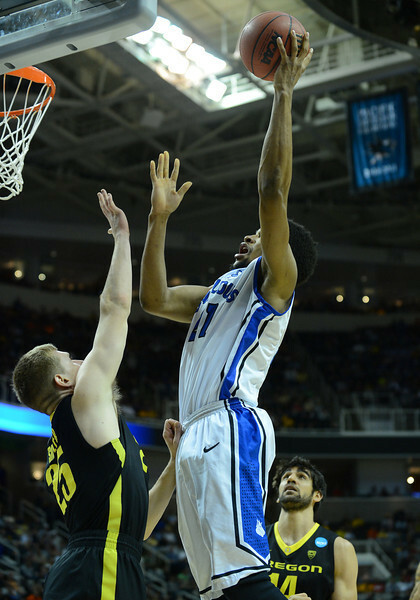 March 23, 2013: Saint Louis Billikens forward Dwayne Evans (21) puts up a shot during a game between the Oregon Ducks and the Saint Louis Billikens in the third round of the NCAA Division I Men's Basketball Championship at HP Pavilion in San Jose, California. March 23, 2013: Oregon Ducks guard Dominic Artis (1) puts up a shot during a game between the Oregon Ducks and the Saint Louis Billikens in the third round of the NCAA Division I Men's Basketball Championship at HP Pavilion in San Jose, California. March 23, 2013: Saint Louis Billikens guard Kwamain Mitchell (3) brings the ball up the court during a game between the Oregon Ducks and the Saint Louis Billikens in the third round of the NCAA Division I Men's Basketball Championship at HP Pavilion in San Jose, California. 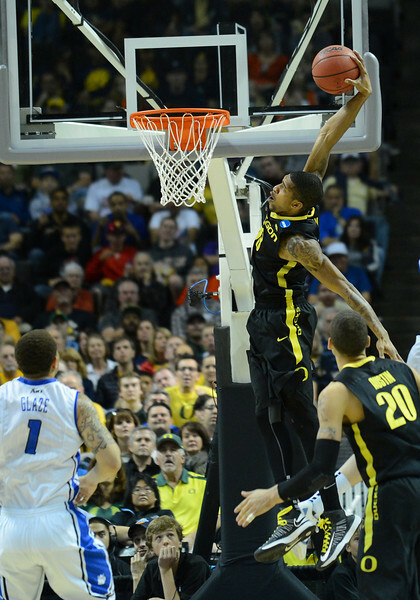 March 23, 2013: Oregon Ducks forward Carlos Emory (33) attempts a dunk during a game between the Oregon Ducks and the Saint Louis Billikens in the third round of the NCAA Division I Men's Basketball Championship at HP Pavilion in San Jose, California. 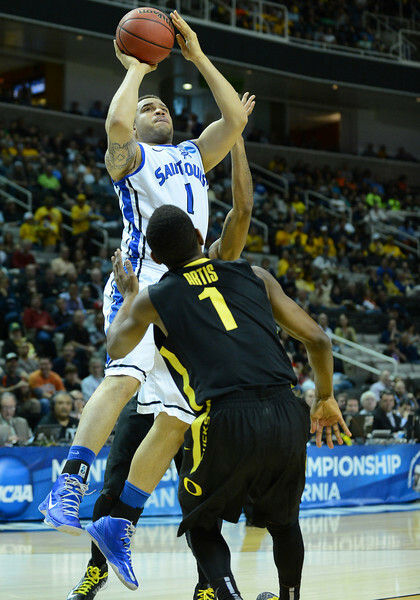 March 23, 2013: Saint Louis Billikens forward Dwayne Evans (21) shoots around Oregon Ducks forward Carlos Emory (33) during a game between the Oregon Ducks and the Saint Louis Billikens in the third round of the NCAA Division I Men's Basketball Championship at HP Pavilion in San Jose, California. 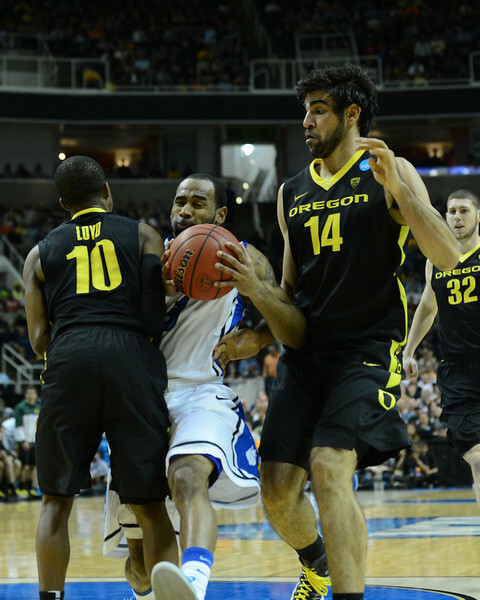 March 23, 2013: Oregon Ducks forward Arsalan Kazemi (14) battles for a rebound during a game between the Oregon Ducks and the Saint Louis Billikens in the third round of the NCAA Division I Men's Basketball Championship at HP Pavilion in San Jose, California. 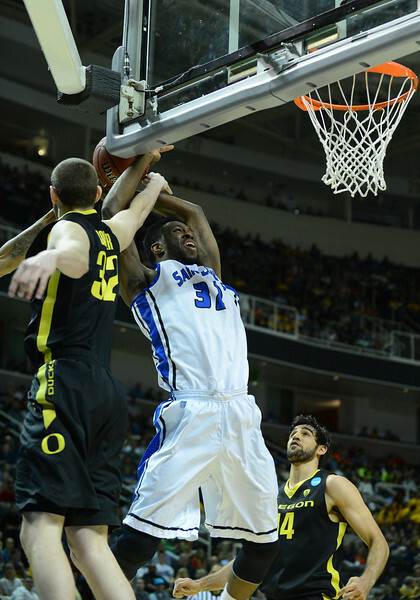 March 23, 2013: Saint Louis Billikens guard Kwamain Mitchell (3) goes strong to the basket during a game between the Oregon Ducks and the Saint Louis Billikens in the third round of the NCAA Division I Men's Basketball Championship at HP Pavilion in San Jose, California. 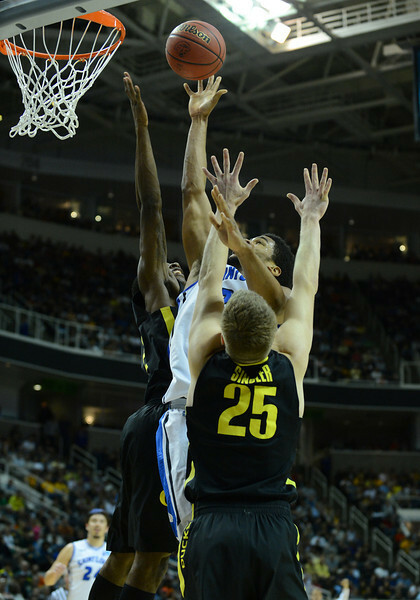 March 23, 2013: Saint Louis Billikens forward Cody Ellis (24) blocks a shot by Oregon Ducks forward Carlos Emory (33) during a game between the Oregon Ducks and the Saint Louis Billikens in the third round of the NCAA Division I Men's Basketball Championship at HP Pavilion in San Jose, California. March 23, 2013: Oregon Ducks forward Carlos Emory (33) contests a shot by Saint Louis Billikens guard Kwamain Mitchell (3) during a game between the Oregon Ducks and the Saint Louis Billikens in the third round of the NCAA Division I Men's Basketball Championship at HP Pavilion in San Jose, California. 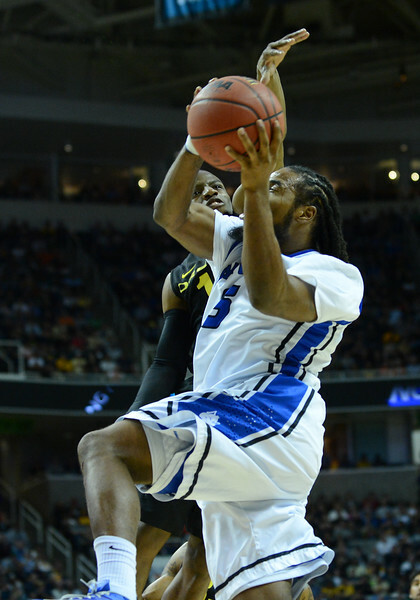 March 23, 2013: Saint Louis Billikens guard Jordair Jett (5) is fouled driving to the basket during a game between the Oregon Ducks and the Saint Louis Billikens in the third round of the NCAA Division I Men's Basketball Championship at HP Pavilion in San Jose, California. March 23, 2013: Oregon Ducks cheerleaders take the court during a game between the Oregon Ducks and the Saint Louis Billikens in the third round of the NCAA Division I Men's Basketball Championship at HP Pavilion in San Jose, California. 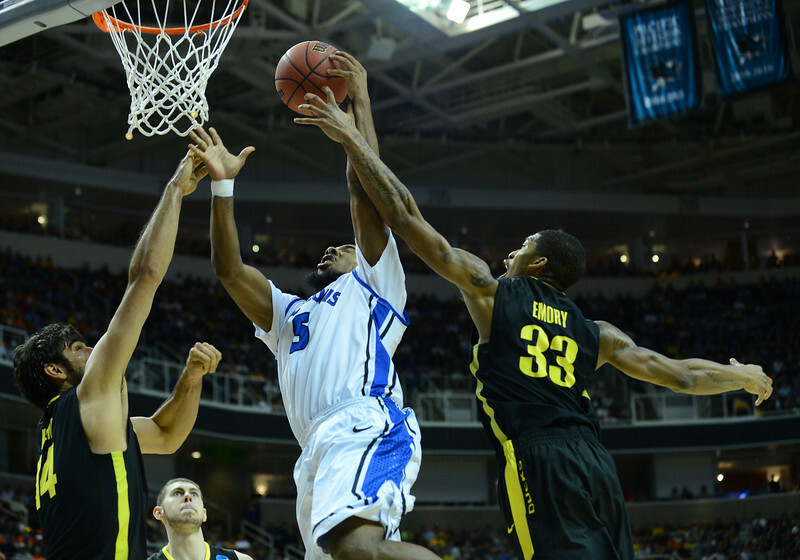 March 23, 2013: Saint Louis Billikens forward Dwayne Evans (21) tries to guard Oregon Ducks guard Johnathan Loyd (10) during a game between the Oregon Ducks and the Saint Louis Billikens in the third round of the NCAA Division I Men's Basketball Championship at HP Pavilion in San Jose, California. 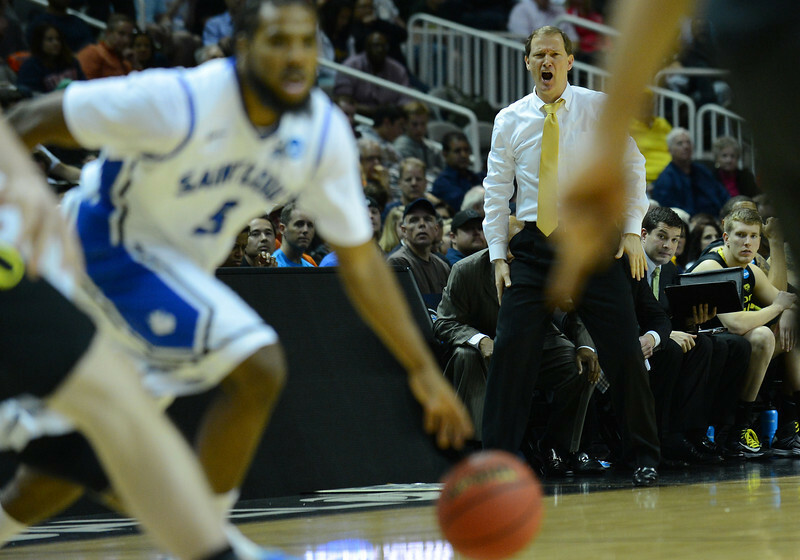 March 23, 2013: Oregon Ducks head coach Dana Altman yells instructions to his team during a game between the Oregon Ducks and the Saint Louis Billikens in the third round of the NCAA Division I Men's Basketball Championship at HP Pavilion in San Jose, California. 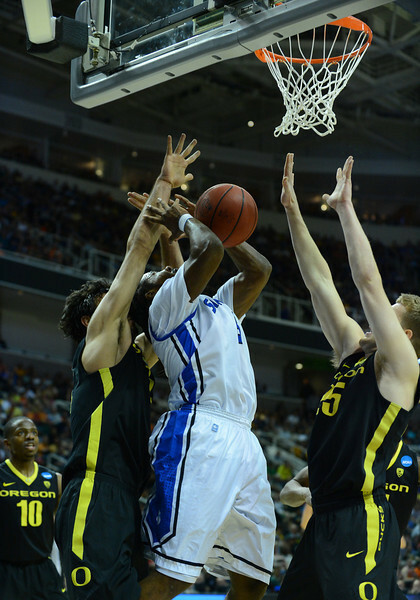 March 23, 2013: Saint Louis Billikens guard Kwamain Mitchell (3) drives into traffic during a game between the Oregon Ducks and the Saint Louis Billikens in the third round of the NCAA Division I Men's Basketball Championship at HP Pavilion in San Jose, California. 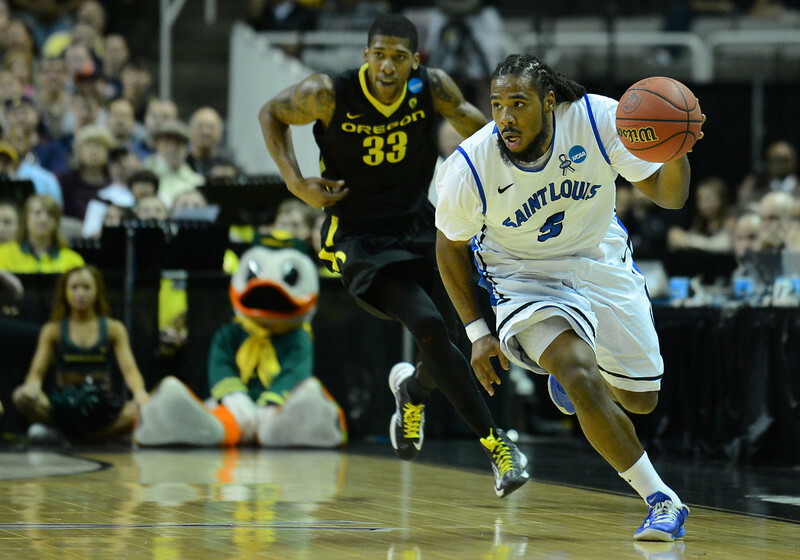 March 23, 2013: Saint Louis Billikens guard Jordair Jett (5) brings the ball up the court during a game between the Oregon Ducks and the Saint Louis Billikens in the third round of the NCAA Division I Men's Basketball Championship at HP Pavilion in San Jose, California. 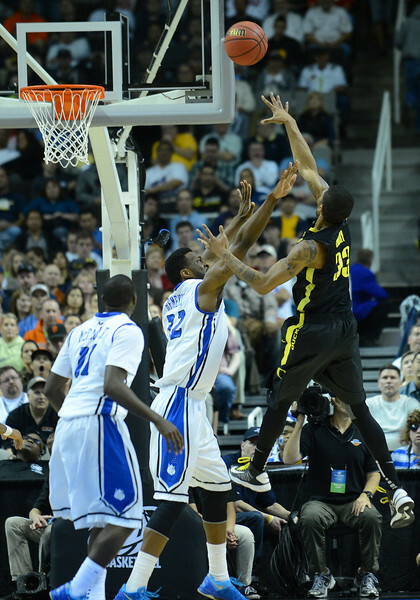 March 23, 2013: Oregon Ducks guard Johnathan Loyd (10) tries to block a shot attempt by Saint Louis Billikens guard Jordair Jett (5) during a game between the Oregon Ducks and the Saint Louis Billikens in the third round of the NCAA Division I Men's Basketball Championship at HP Pavilion in San Jose, California. March 23, 2013: Oregon Ducks guard Johnathan Loyd (10) floats a shot over Saint Louis Billikens guard Jordair Jett (5) during a game between the Oregon Ducks and the Saint Louis Billikens in the third round of the NCAA Division I Men's Basketball Championship at HP Pavilion in San Jose, California. 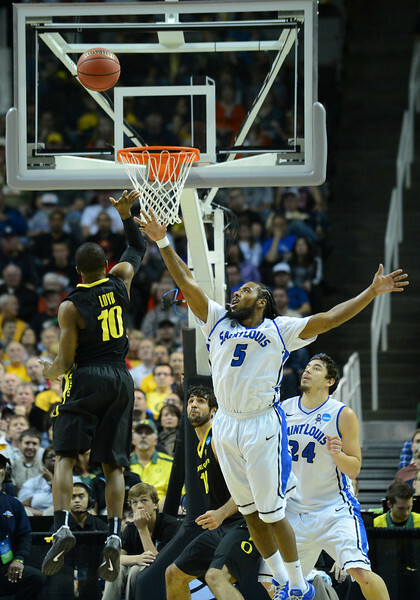 March 23, 2013: Saint Louis Billikens guard Jordair Jett (5) goes up in traffic during a game between the Oregon Ducks and the Saint Louis Billikens in the third round of the NCAA Division I Men's Basketball Championship at HP Pavilion in San Jose, California. 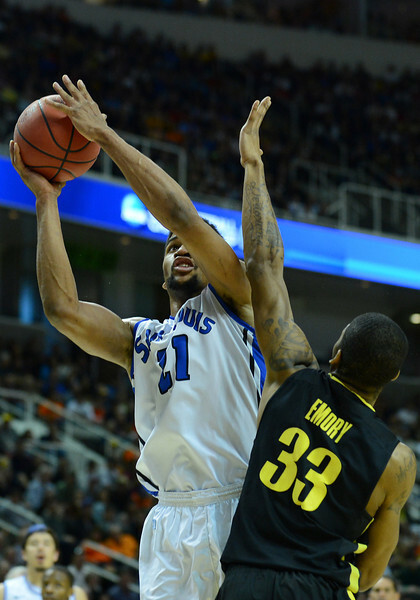 March 23, 2013: Saint Louis Billikens forward Dwayne Evans (21) puts up a contested shot during a game between the Oregon Ducks and the Saint Louis Billikens in the third round of the NCAA Division I Men's Basketball Championship at HP Pavilion in San Jose, California.